Chains are an integral element in tatting. Chains are one of two basic elements first learned in tatting and bridge between rings to move along the line of progression. 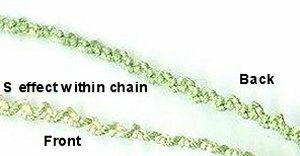 Chains can be made both with double stitches and encapsulated lark's head knots. A double stitch is the under over over under manuever flipping the shuttle thread onto the working thread, where lark's head knots are encapsulated over the core thread directly in an over under under over manuever. Tatted double stitch (ds), S1 flipped over S2 core or in the case of a ring S1 flipped over itself. Manuever: under over, over under. Encapsulated Lark's Head Knots, S2 wrapped over S1, ie. as done to make stitches on the second side of split ring. Manuever: over under, under over. Work is not reversed. Here we see a ring/chain combination. To create a chain with a curve away from the base of the ring (convex) one would normally reverse the work. 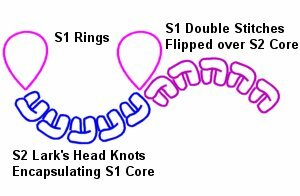 In this case the same effect can be achieved by wrapping the S1 thread over the hand and wrapping the lark's head knots directly to the S1 core. The advantage to this method is one remains on the front side of the work and no reversal of work is needed. Pearl tatting is done by introducing a third thread as the core. Double stitches are tatted and lark's head knots wrapped over that core. However, if you do not use a third thread and alternate between the flipped and non-flipped stitches using the opposite shuttle thread as the core of the current stitch, the effect is dramatically different. Pearl tatting keeps the stitches in line and straight over the core, the absence of the added thread as a stable "in line" core thread causes the stitches to tilt and creates a delightful "S" effect because of the visibilty of the core thread leading into the next stitch. 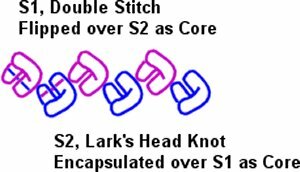 1 Double Stitch followed by 1 Lark's Head Knot, repeated for the length of the desired chain segment gives the "S" like illusion within the construction of the chain itself. The chain remains straight and does not possess a curve. 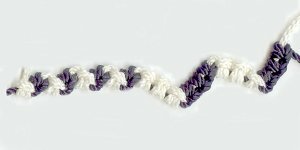 It should be noted that even tension is critical to create an even and smooth "S Chain" effect and should not be confused with the term zig zag or Zig Zag Chain because of the inherent qualities of this chain produced by alternating the single stitches individually. In this example, when more than 1 ds and 1 lhk is repeated per chain segment, the effect is a "zig zag" effect, creating a "Z" or "Zig Zag Chain". The stitches are facing the same direction. The width of the work is determined by the number of stitches per chain segment. Introduction of beads when switching shuttles can add to the beauty of the work as demonstrated by Rosemarie Peel in her "Beaded Z-Chain" Bracelet. Another demonstration of the use of ds and lhk can be seen in her book "Tatting with Beads II" in her "Bangle" design. Seen together in white thread denoting S1 and black thread for S2, the contrast between the two methods of making the chains is prominent. The S-Chain is compact and straight, making it ideal for use in drawstrings or creating loops of such projects as snowflake ornaments. It can be used anywhere to give a delicate texture change and character as a bridge to the next element without an added curve natural in regular chains. The Z-Chain increases the width of the work spanning from element to element or on it's own to create a zig zag path for the chains to follow in the line of progression. Here we see how the chains move from the ring configuration to ring configuration to create the illusion of a zig zag chain between the other elements. 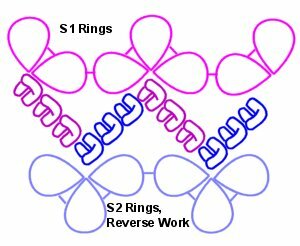 The S1 Rings and S1 chain are made before the work is reversed to make the the S2 rings and then reversed again to encapsulate the S2 chain. When employing the encapsulation method for the S2 chain only the S2 rings are worked from the reverse side of the work, or S1 rings facing in the opposing direction. This means over all those tatters who prefer working on the front side of work majority of the time can do so without reversing every other element. If no opposing elements are present in a pattern switching shuttles in the same color will allow the tatter to tat or encapsulate the appropriate chains facing the correct direction using the principle noted in the paragraph on convex and concave chains. This demonstration may be copied for teaching purposes, please give the author recognition when doing so including this web page url.